By now, if you've read this blog's thoughts about Alabama's basketball team, you pretty much know what I'm going to talk about: outstanding defense, a shaky offensive strategy and whether this team can create enough of a frenetic pace to be successful. The 2012 version of Alabama — now 11-3 after whipping a (bad) Georgia Tech team in Atlanta on Tuesday — isn't exactly breaking any new ground here. • The offense is still not great. Of course it isn't. No one is ever going to mistake this unit for a vintage Kentucky or North Carolina team. But it is ... a little better. Currently, the squad shoots slightly better than 46 percent from the field, a full 10 percent better than last year's team. The 3-point shooting is still abhorrent — under 30 percent for the year — but on the whole it's a little better. Two huge obstacles remain for the squad on offense: first, the halfcourt offense; specifically, I'm not sure if we have one. In the heartbreaking loss to Georgetown, the Hoyas played a 2-3 zone, and Bama had no answer (and really, appeared to have no idea what to do). Transition basketball is fun, but when the game slows down, you have to have some kind of answer. Right now we do not. And second, of course, is our lack of depth at point; right now, the only reliable ball-handler is Trevor Releford, currently averaging nearly 29 minutes per game. Even that average doesn't truly reflect how little faith coach Grant has in his reserves (Ben Eblen and freshman Trevor Lacey). In the home win vs. Oklahoma State last week, the Cowboys pressed our non-Releford guards and nearly destroyed both of them. Grant, who was trying to rest his point's legs, had to bring him back quickly to right the ship. If Releford gets hurt, gets into foul trouble or just needs a blow this spring, hold your breath. • With the return of Andrew Steele Tuesday in Atlanta, Alabama now has 11 players it can play, almost interchangeably. Not counting Steele — who played 12 minutes and made both of the shots he took and all 5 of his free throws — the Tide has 8 players who have played over 10 minutes per game, plus two more — Eblen and 7-footer Carl Engstrom — averaging over 6 minutes. This is important for two reasons: first, it allows Grant the depth to play the kind of pressure defense he wants (a lot of bodies means a lot of energy and a lot of fouls); an invaluable resource in league play. And second, it allows Alabama some flexibility in style. The team can go big with guys like Jamychal Green and Engstrom, can go small with Lacey, Releford and Levi Randolph, and its best player — Tony Mitchell — can play 2, 3 or 4 effectively. As always, the defense is what's driving the engine. Tuesday night they threw Tech — down, but still an ACC team playing at home — so badly off its game, the Jackets threw in the towel early in the second half. It's a point of pride for this team, and I love to watch for that very reason. Looking ahead, the next two games — at Georgia, home vs. LSU — are games the team really should win, if only because the following three — at $tate, home vs. Vandy and at Kentucky — aren't games that should make or break our resume in March (which, for better or worse, is what this time of year is all about). 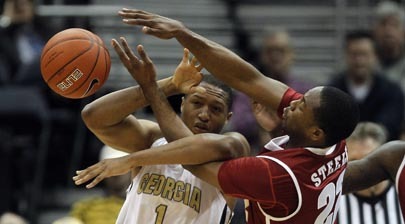 The SEC should be a much better basketball conference in 2012, so it's a good idea to win the ones you're supposed to. Tony Mitchell is the best player, and if he checks out like I've seem him do a few times, I'm very excited to know that Grant will rip him out of the game. Also...you should know that I want to fight small children when I see #5 walking/standing around. I realize that we've got no offense, but when he never moves, stands two feet from the point guard, calls for the ball, takes a terrible shot, and then WALKS down the court with seemingly no desire to get back on defense...I want to stick needles into my...er...uh...your eyes.